It’s so funny that I’ve waited so long to post this recipe because it’s a really, really good one. I made this in early fall when I could still put things outside on the balcony to photograph. It’s not that I forgot about this tasty chicken meal, but it’s because I took a photo of this meal in my well-worn Jadite dish. Let me explain. I love this dish. It treats me well and I think I do well by it too. But it is by no means a pretty dish – well, not after I’m through with it. Sure, it’s got a lovely vintage green hue…but it stains easily and it’s near impossible to scrub away all of splatters. No matter how hard I scrub it with my miracle baking soda-vinegar-soap concoction it won’t become pristine (however, my miracle mix does work wonders on bathtubs and cleans grimy ovens like nobody’s business). What I wouldn’t give for a dishwasher! And a window in the kitchen! And more cupboard and counter space! Actually, I’ve got a whole list of wants & you can see them all & follow me on Pinterest because I’m sort of addicted. But I’m snapping out of my perfect dream world because I made this dish last week with every intention to take another photo. But then dinner was running late, we were starving, and when it came right down to things, we just chomped down. There was no waiting to take photos because this is a chicken dish you just want to inhale. New photos be damned! We dug in and licked our fingers. Happiness achieved. There is a bit of prep time because the chicken should marinate for a couple hours so that the chicken gets a lemony soak, but other than a bit of advance planning, the rest is a snap. The first time I made this, I threw caution to the wind and left the skin on. But it’s January now and I’m much more sensible, so I pulled that skin right off before marinating it. Chicken skin, I understand the lure, but either way, it’s delicious. Your call. elsewhere: Need a bowl of gluten-free comfort? Try my coconut and lime rice pudding over at Poppytalk this week. It’s a no-fuss way to near instant happiness. And it’s vegan to boot! Rinse and dry chicken and place in a ziplock bag. Combine remaining ingredients in a small bowl and pour over chicken. Seal bag and refrigerate for 2 hours, flipping the bag once. Preheat oven to 425F. Place chicken and marinade into a baking dish and bake for 45-55 minutes. The chicken is done when the juices run clear after being pierced with a knife. I really like the first photo! It looks quite rustic in an eat-me-now kind of way! I know the feeling well. Photos be damned. Just chomp down! This recipe sounds like one of those dishes that the sum is greater than its parts. Oh wow. I love simple recipes like these … that are also so, so good. And the chicken is baked! Awesome. I bet these would be great on the grill too. Which I would do … if it wasn’t January. Great stuff. ha ha. i have one of those pans too, and it’s impossible to clean, but i love it. These photos look lovely to me! And so does this recipe! Chicken thighs are being added to my grocery list for next week. I’ve already got everything else! Have a great weekend! Aw thanks Joanne for calming my dish paranoia! Ha!! Thanks Molly. I’m so bad with taking photos – I have so many great dinners I’ve forgotten to photograph over the years. But I think it’s okay to just enjoy food for enjoyment sake. Photos be damned! If I had a grill & it was warm out, Tommy, I’m sure this would be great on it! Great idea. Vanillasugar, it did smell amazing. Glad I’m not alone in the pan scrubbery club! Amanda, I hope you give this a go, it’s a great dish. Hey kickpleat, question – do you ever buy the chicken thighs at the Sunrise Market in Strathcona? I usually just go with the veg there, but wondering about the meat counter since it’s in your hood and you seem to love cooking with c-thighs as much as I do. Skin off or skin on, these chicken thighs sound yummy. The marinating part is where I usually go astray since I never think ahead to incorporate that process. Next time try drizzling some olive oil on the chicken before baking. Greeks oil their meat before grilling/roasting/baking. Not sure why but I think it seals in the juices. Works for me every time. I made this last night but wasn’t sure what to do with the two lemons so I juiced and zested them. Was that right? It was very lemony, which I love, but wasn’t sure if I did it right. And I love that wonderful pan — have you ever tried Bon Ami? “Hasn’t scratched yet”! SixBalloons, I have bought chicken from Sunrise in the past and it’s been perfectly fine. They don’t carry organic meats so I’m only buying legs & thighs elsewhere since they’re cheaper than white meat to buy organic. Joanne, I’m keen, I’m keen!!! I so need a powerful dish rag, so we’ll see how it does. Thank you so much! As for the chicken, I’m curious about the olive oil over top. May have to try it next time, though I’m always worried about adding in extra fats. Kirby, yes, it’s very lemony chicken….but I do love the lemon here. Yes, juiced & zested is the correct thing to do. I didn’t zest my lemons, but I think it should be fine regardless. As for Bon Ami, I’ve never seen it – maybe it’s not available in Canada? I’ll keep my eye out for it (I love the packaging!). Thanks! You don’t have a kitchen window? Or a dishwasher? You do an AMAZING job with presentation and photography on your site. I will immediately quit grovelling about the bad light in my kitchen window and my ugly counter tops. That is a beautiful Jadite dish, and the chicken looks very tasty. Thanks for another great recipe! Haha, I know what you mean about having all the intentions in the world about taking photos and then just digging in! Recipe looks lovely, and I do love that green dish! What a lovely, simple dish -the colour on the chicken looks amazing! Haha, I can tell my boyfriend gets a bit antsy when I make him wait while I take pictures of all the food! Whoa! This is making me so hungry. Good call, thanks for the response. Sure is tempting at $2.29 a pound. I tried some of the Sunrise chicken thighs for a thai green curry dish with napa cabbage and spinach and it turned out delish. And cheap. Aw thanks Kate! As for ugly countertops, that’s what pretty tea towels are for! Thank you Clare! Sometimes it’s hard to resist, food blogging be damned!! Lucy, haha, I know the feeling well. SixBalloons, there’s a restaurant line at Sunrise & it gets used all the time. I’ve seen cooks from fancy restos shopping there, so I have no issues with their quality at all. It is cheap, but I’m starting to worry about why meat is so cheap so I’m buying almost all of my fish/meat as either organic/local. I love your roasting dish! I think the freckles and the use give it great character. 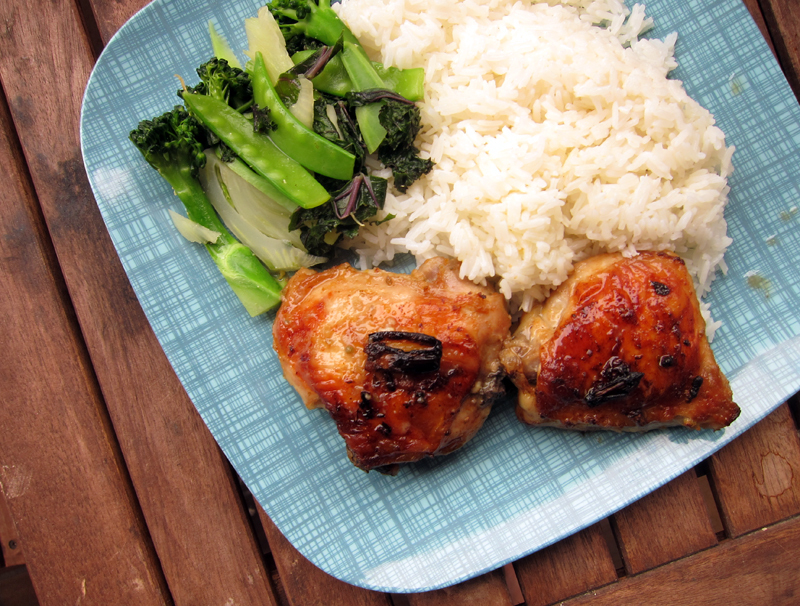 Like you, I love rice with roast chicken. Rice soaks up sauce so beautifully. Perhaps you could give the chicken a lemony soak in the morning before work and by the time you come home, it’s all ready just to bung in the oven, cook rice and vegetables and eat. I love blogging in the summer because it’s still light by the time we eat dinner which makes for better photos. I have yet to master the night time dinner shot and flash is generally horrid. I made this last night and it was de-lish! It’s going into the rotation. How simple, tasty, and lush! Wearing her headphones and watching Downton Abbey, Judy says “Delicious.” Incidentally, without skin, each thigh is about 110 calories, which is hard to believe for something that tastes this good. Maybe I should eat seven of them. Genie, can I tell you how much I LOVE it that you’re calling my pan spots freckles??!! I do love it a lot and thank you. So glad to hear you enjoyed this, Jan. Thanks for sharing. Robert F, so glad you both enjoyed this dish. And really, 110 calories only per thigh?!!! Wowzers. Sometimes, there’s just no time to be wasted taking more food photos (blasphemy!). This chicken looks spectacular! I love it when something is too good to blog — no time for photos! Besides, the blog always gets the food at its best so I’m glad you enjoyed the chicken at its peak. Also, three cheers for chicken thighs. I cannot wait to make this! This looks great cant wait to make it. Thanks Kasey, another food bloggers got to understand, right? Elizabeth, love your enthusiasm. I love chicken thighs a lot. So much flavour. This definitely just went on my wish list! Lynn, oooh, the potatoes!! Must make some, stat. Ooooh, anything with lemon is definitely for me. Will try this out! 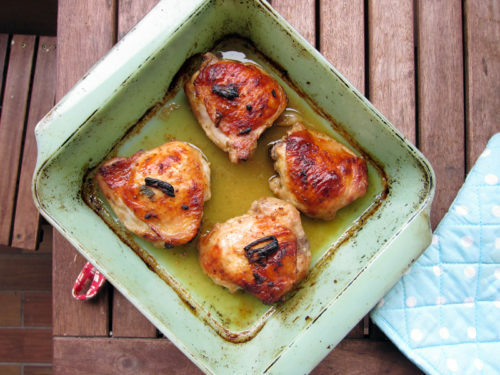 Another great lemony chicken recipe calls for dried basil, lemon juice and zest and soy sauce. Sooooooo good! This looks great and I want to try it, but can’t marinate for 2 hours as I would be at work, have you ever marinated this all day? Has it/would it work? Would love to know your thoughts! Thanks!! Bobbi, yes, you can marinate it for a whole day. Enjoy! !